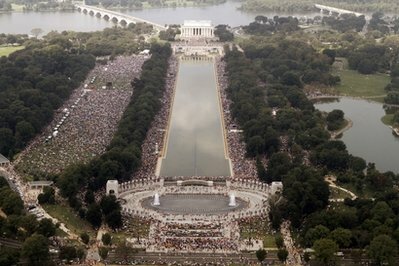 Something on the order of a million people show up to a rally on the national mall , a large number of which are the minorities which the Democrats try so desperately, and so falsely to claim they represent. The first method of trivializing it, of course, is minimizing the number of people who actually showed up. Most mainstream news accounts had the numbers in the thousands. A look at that picture will suggest otherwise. The fact is, that something on the order of a million people showed up. That’s a fact that you’ll never see the left admit to in a million years. Another claim that you’ll see floated is that there weren’t many minorities there. apparently we are to believe that the whole thing was set up by a couple of thousand angry racists. Anyone who saw the event on C-Span or the well over 100,000 who watched on the Facebook links Saturday knows damned well that’s not true, either. They probably didn’t notice that Alveda King spoke as well as a whole string of black leaders. FWIW, I fully anticipate that the C-Span coverage will be available for some time on their website, though admittedly I haven’t even looked yet. Doug goes on on several levels to point out that the Democrats have failed miserably to trivialize it, and make it go away. The article he posts is worth a read. Others will try to trivialize the events on Saturday by suggesting the whole thing was political in nature. Again, anyone who actually watched the event will say otherwise. Certainly, the event has political ramifications, but it was not overtly political of itself. If you’re going to consider the event on Saturday to be overtly political, perhaps your objection is that the speakers and the attendees unanimously suggest that your politics are without honor. I can understand how that would make some folks uncomfortable. The left is now in full retreat. They are confused, and angry. They are in trouble, and they know it. Every poll, every public event, every public discussion, all say the same thing. The left is toast. They are trying to minimize that trouble by minimizing the overall effect of those banding together to reestablish America as such… such asd the rally on Saturday. Frankly, even they know it’s not going to work. It’s going to take a few days for them to start screaming in unison, but until that time, it’s the differences in their commentaries and in their finger pointing which will be most revealing. We have them on the run…they are coming unhinged. It is a beautiful thing to watch and participate in. If we stay united and send a strong message to the Lindsey Graham Republicans we can renew the spirit of the Reagan Revolution and take our country back.